Changing Texas Registered Agent ? It's time to change your Texas Registered Agents! What is a Texas Registered Agent? The state of Texas requires Texas LLCs and Texas Corporations registered in the state to conduct business, have Texas Registered Agent service. The Texas Registered Agent you appoint for your company, will receive legal service and government notices on your behalf. The Articles of Incorporation or Organization for both domestic and foreign entities, ask for the address of the registered office to receive service of process. The Service of Process is a notice of a summons or a lawsuit. $49 Registered Agent fees. If you are not paying $49, you are paying too much. I checked with other agents on the internet, IncSmart rises above them all. We have decided to use a different Registered Agent for our new company filing. The price is great. The order form was easy and the web page has tons of information to use. I think we made the right choice. We need to change our current registered agent. They never send us notices from the Secretary of State, and they are twice as expensive as IncSmart. IncSmart was recommended by a friend. So far, the service has been great. First we hired them as the Texas Registered Agent. Then we notices they did the filing. We had our company completed in two days. No fooling around here. Very impressive. I would recommend them to all of my family and friends. 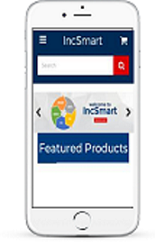 We just moved our Texas Registered Agent service over to IncSmart. We are saving over $100 a year. It's a no brainer. IncSmart has been in business for over a decade. The web site is user friendly and we can sign on to our account at any time. The web site is also a one stop for all business services. The web page said immediate service. It was. As soon as we place our order, the information was in our email. Everything we needed to continue our corporation filing. We followed the link to download in pdf. Another great program is the three year special... next year. IncSmart has great service. We made a mistake on our order, and they made the correction right away. They were friendly on the phone, and were happy to talk with us. The web page is full of information. Ordering the Texas Registered Agent was easy. The webpage is very interactive and fun. I even played around with the Make An Offer. I am renewing for another year. Incsmart has been very helpful sending our notices for Franchise fees. The account sign on is easy to use and lets us see where we are from year to year with our account. We just ordered the new Texas Registered Agent service online. We had the information in our email immediately. Great service and a great price. Incsmart has the best registered agent prices on the internet. We had our agent name and address in minutes of our order. 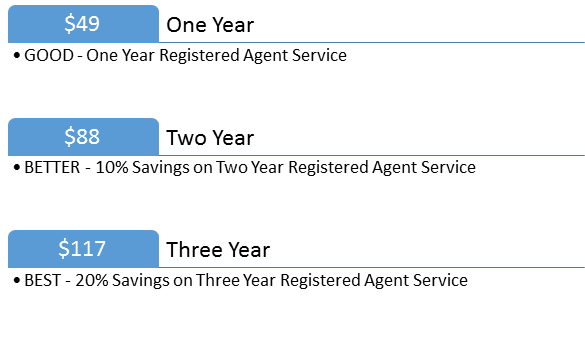 We just renewed for another year for our registered agent service. They have the best fees. We have never missed any mail from Texas. Overall it should have 10 stars instead of five. Thank you IncSmart. You answered all my questions about filing in Texas. The fee is great too. All hat no cattle? Not Incsmart. These people care about the customer. From pricing to service. We could not have picked a better company for support and service. This is our fourth Registered Agent through IncSmart. They have helped our company grow from state to state. The web page has all the information we need to stay on top of the corporation game. We have been using another agent for quite some time. The fees keep climbing year after year. We were lucky to find you on the internet. We needed to change Registered Agent. Our current agent prices seemed to go up in price year after year. IncSmart sent us the Agent information in minutes and the Registered Agent change forms are on the IncSmart web page. It couldn't have been any easier. I highly recommend IncSmart service. Best buy online. Incsmart fees are saving me money. How the competition gets away with $100 fees, I will never know. The best part was instant service. You made changing the Registered Agent for my client very easy. Having the change forms in your library was a huge help. Quick response. Best price. Thank you. 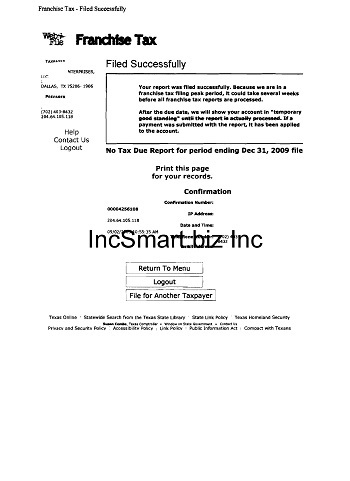 We used IncSmart for our New Mexico LLC. The service has been great. The fees are even better. IncSmart has really great prices for Registered Agent services. So glad we found you on Yahoo. When my other companies come due on their agent services, we will be moving them to IncSmart. Q: I am thinking to change my registered agent, do i have to file or you will file the change of reg agent with Texas Secretary of state? A: You need to sign and file the Registered Agent Change form. The fee is $15. GO TO our "Change Registered Agent" section of our web page. Q: Where is your Texas Registered Agent located? A: Our Texas registered agent is located in Round Rock TX. Q: My Registered Agent resigned. What do I need to do next? A: You need to file a Statement of Change with the Texas Secretary of State right away. Failure to do so may result in the involuntary termination of your company. 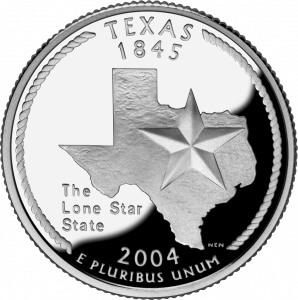 Q: When is the Texas Franchise Tax report due? A: The annual franchise tax report is due May 15. For entities that became subject to franchise tax in the previous year, the first report due is an annual report. 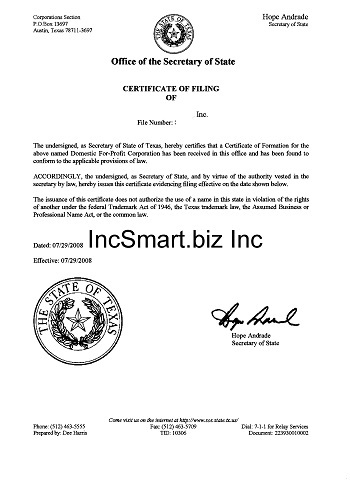 IncSmart Texas Registered Agent will alert you in a timely manner about all documents and service of process received as your registered agent. The state of Texas requires Texas LLCs and Texas Corporations registered in the state to conduct business, have Texas Registered Agent service. The Texas Registered Agent you appoint for your company, will receive legal service and government notices on your behalf. The Articles of Incorporation or Organization for both domestic and foreign entities, ask for the address of the registered office to receive service of process. The Service of Process is a notice of a summons or a lawsuit. Now you too can have a Texas attorney on retainer. No hourly fees. From $17 to $39 a month. Now you too can have affordable attorney access. Your company is protecting you, now you can protect your company.